Soldeu is part of the Grandvalira ski area - a single pass covers the neighbouring village of El Tarter, Pas de la Casa, Canillo and Encamp - 193km of piste in total. 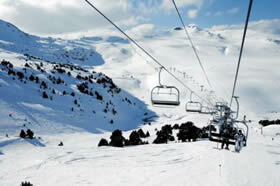 Andorra has received enormous funding in recent years which has been spent on improving the lifts and modernising the ski area. Investment in sophisitcated snow making equipment means that many runs will stay open throughout the season, even in a lean snow year. Soldeu has become a smart little resort with some plush hotels including a new five star palace with an enormous spa centre. The main street is lined with shops, bars and restaurants so provides lots of choice. Lots of summer mountain activities available. Sport Wellness Mountain Spa, Caldea thermal spa in Andorra la Vella, sports centre, ice skating, indoor swimming pool, skidoos, dog sledding, snowshoe trails.